I Love You More Than Carrots: Out With the Old. In With the New. Beach Tote, that Is. Out With the Old. In With the New. Beach Tote, that Is. I really have no qualms with this bag. Perfect size for a couple of beach towels, bottles of water and suntan lotion. As a matter of fact, I used it so much there's still some OCMD sand in it from last year's Beach Week. It really was the perfect fit... for 2008. I need this bag. Hubs, are you reading me? With this bag I will be embracing my Maryland-thru-marriage-heritage. You just can't go wrong with a classic Blue Crab! L.L Bean Tidepool Boat and Tote. B-o-a-t and T-o-t.. Ya got me? Don't forget to check retailmenot.com for free shipping codes! You'rethebesthusbandeverinthewholewideworldandiloveyoubunches! I love the madras on the first one and hopefully it served its purpose. 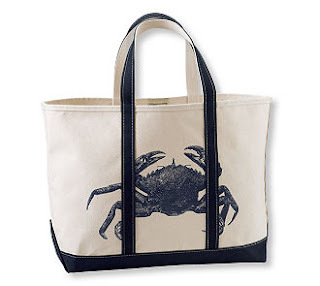 The crab tote is very cute and reminds me of Maryland too. I used to go to OCMD when I was little and loved it. I miss going there and I'm trying to convince hubby to go for a long weekend this summer. LL Bean totes are swoonworthy! I own one for everything! Gym, school, beach, etc... I love the blue crab!! That is one cute bag. That is adorable! I have never seen anything like it either, so +1 for originality, too! oh cool.. I'm less than half an hour from there in Annapolis. I love the first bag (mainly because I have one similar). I adore the second bag as well. I am just a bag person.